Modular homes are a great alternative to traditional on-site new home construction. Because most of the initial service and work is done in an off-site, climate-controlled factory using an engineered approach to building, these systems built houses offer a more efficient and cost-effective method for building your dream home. After individual, custom-designed modules are created by the manufacturer, they are transported to the building site. A local builder applies the finishing touches after joining the sections together using the same methods and standards used for stick-built houses. The result is that beautiful one- and two-story modular homes can be purchased at significantly lower cost per square foot. Modular homes match the quality and appearance of traditional stick-built houses. This is not boring prefab housing with no curb appeal. Modular construction offers a wide range of custom-designed floor plans that can deliver your family its custom luxury house. Our free online consumer guide is here to help you understand the pros and cons of modular housing, help you review home builders and show you some of the thousands of customizable floor plans you can pick for your dream house. Modular built houses have no design limitations. Your manufacturer and local builder can work together to create any dream house you want. The key difference between prefab homes and traditional houses is that modular houses start out as individual sections that are constructed in a factory. The finished section are transported to your selected building site and then assembled together using giant cranes. The assembly process looks a little like building with Lego blocks but the standards are obviously a lot higher. Modular houses are built on foundations and cannot be moved after they are set on their foundation. These prefab houses can be any shape or size and will meet or exceed your local and state building codes. Once they are fully constructed, they are just as strong and attractive as any building constructed with traditional methods. On the other hand, mobile homes (also known as manufactured homes) are built according to the federal HUD Building Code. This requires all mobile houses to be built on a non-removable steel chassis that severely limits their design options. Mobile houses can be moved from one site to another. Manufactured houses are not built on permanent foundations. Check out our home construction comparison chart. These homes can have any feature a traditionally built house enjoys. You can have glass sunrooms, extra tall ceilings, warm fireplaces and anything else you can dream up for your custom floor plan. 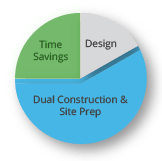 Even with customized plans, you will save time and save money with modular. 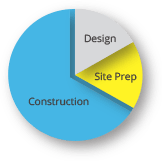 We have gathered over 500 floor plans from the best prefab builders across the nation so you can preview the great designs they offer. Remember these home designs are just a starting point and you can custom design your new home so it perfectly fits your family's lifestyle. Go ahead and browse our modular home floor plan gallery and see the great looking homes that are being built today. Modular construction projects continue to become more common as homebuyers learn more about them and better understand the construction process. Using streamlined production process it delivers higher efficiency and a higher quality house. The prefab construction speed is faster than on-site construction since manufacturers build your house inside a factory and weather cannot cause delays. Weather delays in site-built construction can greatly increase labor costs. Home buyers also don't get stuck with the tab for wasted building materials exposed to wind, rain, snow and general rot at the building site of old fashioned construction. Prefab home prices will vary depending where you live. A general estimate is that stick-built houses cost upwards of $150 per square foot while mobile aka manufactured homes will cost $40-$80 per sq. ft. Modular housing prices will be about $90-$150 per sq. ft. For more precise pricing estimates, use our directory of home builders. These veteran builders will be able to give you accurate constuction prices based on your personal building situation and your preferred floor plan. Also, read our article about modular home prices. Prefabricated modular houses allow you to afford the home that has all the options you want. You can have a basement, multiple levels, extra bedrooms, increased energy efficiency and additional insulation in your luxuy home. Modular home manufacturers allow you to select different custom options so you can have the floor plan of your dreams. You can now enjoy your dream home at a lower price - made possible by the efficiency of prefab technology. Modular housing looks just like traditionally built homes. The big difference is that these prefab homes are pre-built in factories and assembled on-site. This process provides time savings since construction on the modular building can begin in the factory while the site preparation work is being done (leveling of ground, laying foundation, etc.) and weather delays don't slow down the work in the climate-controlled space. Don't take our word on the beauty of these houses. Explore our gallery of modular home floor plans highlighting hundreds of prefab home plans from builders across the construction industry. Keep in mind that you can use these plans as a starting point and customize them to suit all your needs. Find out how these houses compare to old-fashioned stick-built houses and mobile homes. Learn the facts about modular houses vs a manufactured home and avoid confusing misconceptions. We brush away the marketing fluff and compare these housing options. Become informed so you can make the best decision for your family and your budget. Don't be surprised that modular homes are easy to finance. Financing is the same as old-fashioned construction financing because they meet or exceed the same building code standards as stick-built homes and are placed on permanent foundations. That is why they are financed the same way as stick-built homes. Find out your financing options to make your dream home a reality. Many confuse prefab with mobile homes and think they are ugly or poor quality. Let our gallery open your eyes to the beautiful modular world and enjoy all the different styles from simple ranches to stunning mansions that are available. The huge modular home manufacturer factories are impressive and the custom homes and mansions they produce are even more impressive. Looking for even more information? Order the Insiders' Guide to Modular Homes! 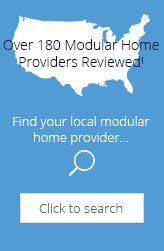 It has over 164 updated pages written specifically for the modular homebuyer. This eBook provides unbiased information from industry veteran Tim Key. Learn from his insights and avoid costly mistakes that can waste thousands of dollars and cause months of headaches when building your dream house. Search the most comprehensive directory of prefab manufacturers! Our team of editors has manually reviewed each company to ensure the accuracy of this directory for homebuyers. Your family can now make an informed decision when choosing the right manufacturer for your new home. We have even made sure to compare the energy efficiency in our reviews so you can decide which modular manufacturer is right for you.